I was diagnosed at the age of 33. My first symptom was an overall weakness compared to other kids in gym class in grade school. High School gym class was even worse. I experienced tight hamstring and calf muscles. My calves were large. Next was the noticeable change in my gait. 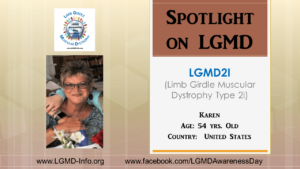 Do you have other family members who have LGMD? No, I am the only family member diagnosed with LGMD. The greatest challenges of living with LGMD are completing daily personal and household tasks, managing activity and rest, being prepared to access public spaces, and planning for future needs. With the love and support of my family and friends, I embrace and experience life in spite of ever changing limitations and obstacles. That is my greatest accomplishment. How has LGMD influenced you into becoming the person you are TODAY? Living with LGMD has formed me into an accepting, determined, resourceful, humble, and grateful person. I learned to accept my diagnosis and realize that, as it progresses, it provides me with the opportunity to grow as a person. What do you want the world to know about LGMD? LGMD is a progressive disease. It affects every thought that goes into every motion of every day. Continued research and development for a cure, treatment, and assistive devices are essential. If I was cured tomorrow, I would Rollerblade!